Lady Eleanor Petersham knows exactly what she wants from her marriage - a man who will worship at her feet. Instead, her father marries her off to her brother's best friend, the devastatingly handsome, authoritative, and devilishly dominant Lord Edwin Hyde. It doesn't matter that he makes her entire body tingle when he kisses her, or brings her to heights of pleasure she's never known, or how he disciplines her when she plays nasty tricks on him - like throwing a dinner party which only includes dishes with ingredients he despises - she's not willing to give up on her version of marriage without a fight. Pain and pleasure struggle for dominance the same way husband and wife do in this relationship. 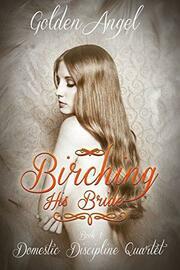 Birching His Bride is approximately 52,000 words and is an introduction to Edwin and Eleanor's story, their world, and their friends and family. Their story continues in the rest of the quartet... HEAs guaranteed.